Strong College is collecting the new state quarters that the United States Mint has been producing for a year and a half or so, a project that will continue for ten years and will include all fifty states. Five new quarters appear each year, and each state’s quarter features some representative symbol of that state on the reverse: Georgia has a peach, New Jersey has the Crossing of the Delaware, Connecticut features its Charter Oak. The most recent quarter to appear was from my own state, Massachusetts, and it features the statue of the Minuteman. The Nineteenth of April is the day of the Minuteman, celebrated in Massachusetts as a state holiday called Patriot’s Day. When the quarter first came out a few weeks ago, one of our students asked me who the Minuteman was. This essay is my answer to that question. By the mid-1700s the New England colonies had a long history of self-government behind them. By virtue of the great distance between them and their mother country, they had been accustomed for generations to managing their own affairs, with little oversight from England. Because England had incurred a great deal of debt from its frequent wars with France, the British Parliament decided in the 1760s and early 1770s, to try to raise some revenue by taxing the colonies directly, something it had not done before. These taxes were not terribly burdensome, but a great many people were disturbed by the principle: the colonies had always governed and taxed themselves, and they resisted the idea of having to contribute to what they saw as an “external” government. Rather than pay a tax on imported tea, they dumped it into Boston Harbor. When ordered by the Royal Governor not to hold a town meeting, the Boston representatives held it anyway. A local crowd harassing a group of young British soldiers was fired upon in what came to be called the Boston Massacre. For several years these tensions built and built, until they came to a head in the first few months of 1775. Parliament had ordered the Port of Boston closed—a heavy economic burden for a major trading center—and had ordered the towns to cease holding local meetings. Massachusetts was effectively put under military rule, but since there was only one major garrison, in the city of Boston itself, most of the people in the countryside ignored the orders and continued to act as they always had. They did, however, begin to collect arms and ammunition, and to reactivate their militia system that had fallen into disuse since the end of the French and Indian War a decade earlier. Many of the towns also created special companies within their militia that were ordered to be always ready to march “at a minute’s warning” in case of emergency. These special companies were called minutemen. The collecting of muskets, gunpowder, cannon, and other arms for use of the town militia was a violation of the orders of the military governor, General Thomas Gage. Gage was aware that these stores were being collected, and his British garrison had carried out several missions to confiscate them in the months prior to April 1775. On one occasion the British troops had successfully marched from Boston and captured a large supply of colonial gunpowder that was being stored in the nearby town of Somerville. This maneuver enraged the local population, as much because they had been caught off guard as because they had lost their powder. Determined never to let that happen again, the towns refined their elaborate system of alarm riders who were responsible for spreading word of British troop movements throughout the countryside. The system was mobilized in February when another British force was sent by ship to the coastal town of Salem to seize a store of powder and arms. Advance warning to the local population allowed them to raise an intervening drawbridge and move the munitions away, and the troops left empty handed. As the spring came, General Gage received orders from London instructing him to take decisive action to put down the rebellious town governments and to capture those inciting the rebellion. In response to these orders, Gage decided to make another move into the countryside to capture the largest colonial munitions supply, the one at Concord in Middlesex County, about eighteen miles west of Boston. The plan was to move quickly soon after dark with complete secrecy, be at Concord by dawn to seize the supplies, and then return to the garrison in Boston by midday before the colonists could even spread word of what had happened. But the colonists were watching too carefully, and in the small space of Boston secrecy turned out to be impossible. By the afternoon of the eighteenth it was clear to the inhabitants of Boston that some sort of military operation was about to take place. The British troops had altered their regular schedules, transport boats had been pulled up in the harbor, and the soldiers looked unusually preoccupied. American spies within the British headquarters were urgently contacted, and it was discovered that a mission was planned for the next day to capture the arms at Concord. The American alarm system went into action, and riders were sent by several routes to notify not only the militia at Concord, but all the militia companies throughout the colony that Concord was in need of assistance. One of the riders was William Dawes, who talked his way past the British sentry guarding the overland entrance to the city, and then rode westward through Roxbury, Cambridge, and Menotomy toward Lexington and Concord. Another rider was Paul Revere. He slipped out of the city by rowboat, passing right under the bow of the British warship Somerset, and took a northerly route toward Concord. In the event that he was captured before he could escape, he had arranged with observers on the opposite shore a lantern signal from Boston’s North Church steeple: one lantern if the British troops were moving out that night overland, and two if they were crossing the river in boats and taking the northern route. The British took the water route late that evening around ten o’clock, and two lanterns were hung in the steeple. Even before Revere got across to the other side, word was spreading of the impending march. The alarm spread with great speed throughout the countryside all through the night of the eighteenth and the early morning hours of the nineteenth. As the British column of 700 red-coated soldiers marched westward in the darkness toward an objective that only their commanders knew, they began to hear bells ringing in the distance ahead of them, and alarm guns being fired to waken the population. Not long after midnight several of the militia companies along the road to Concord had already heard the town bells and heard the alarm guns, and had gathered at their appointed meeting places to find out what was happening. As the network of alarm riders fanned out across the countryside, the remoter towns to the north, west, and south received the alarm as well, some later in the morning, some not until mid-day. It reached the north shore town of Beverly about eight o’clock in the morning, and twenty-year-old minuteman Simeon Dodge mustered with his company and headed for the road to Concord. The town of Groton, just west of Concord, heard the news about the same time. Forty-one-year-old Lieutenant Zechariah Fitch had to leave behind his wife, who was nine months pregnant, to lead his Groton minutemen toward Concord. Thirty-nine-year-old Lieutenant Job Shattuck, another Groton farmer, gathered his men and marched as well. The same scene was repeated in every town across the colony that morning. Even old men responded to the alarm: in the town of Harvard, west of Groton, sixty-year-old Ebenezer Burgess left his farm and headed for Concord with his militia company. The town of Lexington lay right along the road to Concord, and the Lexington militia had already assembled on the town green while it was still dark. There was confusion about what exactly was happening, and it wasn’t certain how far away the British troops were, or whether in fact the whole thing might have been a false alarm. But it was no false alarm, and just as the sun was rising, about five in the morning, they saw the long British column coming up the road toward them. The British vanguard formed up in a battle line on Lexington green facing the militia, who numbered only thirty-eight. A British officer ordered the militia to drop their weapons and disperse. They did begin to disperse, but they didn’t drop their weapons, and then from somewhere a shot was fired. To this day, no one is certain where the shot came from. It may have been from the British lines; it almost certainly wasn’t from the Lexington militia. It may have been from a bystander, or it may have been an accidental misfire. Whatever its origin, that first shot started the British soldiers firing, without orders, into the dispersing militia. When the smoke cleared from those very few minutes of confusion, eight Lexington militiamen had been killed and nine wounded. Some bled to death on the front steps of their houses around the edge of the green. This attack had not been planned, and the British officers, many of whom still did not know their mission’s objective, grew worried. Their commander now told them that they had several more miles to go to the west. As the sun rose, they could see in the distance men moving across the open countryside from all directions heading toward Concord. When the British column finally reached Concord, at seven o’clock in the morning, they had very little success with their principal mission. Nearly all the arms had been hidden away over night and the larger artillery pieces had been buried in the freshly-plowed fields. One British detachment moved to the northern part of the town and secured a bridge there while an advance party went across the Concord River to search farm houses on the other side. The small detachment at the North Bridge watched as hundreds of militia began to assemble on a nearby hill. In the center of the town the British search parties set fire to some gun carriages they had found, and the militiamen assembling near the North Bridge saw the plume of smoke and believed the troops were beginning to burn the town. They marched forward to the bridge and the British opened fire. The Americans returned fire, and several more were killed on both sides. The British detachment was driven back to the center of the town, and soon the entire British force began to march back the way it had come, down the long road to Boston. By the hour, more and more militia and minuteman companies were arriving from the surrounding countryside, and the British retreat turned into a brutal rout, a battle three hundred yards wide and eighteen miles long. At every turn of the road a militia company was waiting and fired into the British ranks. The British were fired upon from many houses along the road, and in response their advance parties began burning nearly every building they came to. In the village of Menotomy, between Lexington and Cambridge, the fighting was especially fierce, and the exhausted and terrified British soldiers forced almost every house along the road and killed all the inhabitants. Young Simeon Dodge’s company of Beverly minutemen encountered the British column at this point, and he survived one attack only by hiding in a cellar. About eight o’clock on the evening of the nineteenth, the British column finally reached the safety of its own lines across the river from Boston. They had been marching for almost twenty-four hours, the last six hours under heavy fire. They had suffered more than 272 casualties, including sixty-five killed. The Americans had suffered ninety-four casualties, including fifty killed. Twenty-three towns had at least one member of their militia killed or wounded. Within two days, 15,000 men from across New England had assembled and surrounded Boston, and the British were never able to move more than a short distance off that small peninsula again. Three months later, at the request of the Continental Congress in Philadelphia, a Virginian rode north to take command of that citizen army that had laid siege to the city. His name was George Washington, and the 15,000 New England militiamen became the American army. Eleven months later, the British garrison was evacuated by sea and was never seen in New England again. The news of the first shots at Lexington traveled faster than any news ever had through the American colonies, in a time when a journey of a hundred miles often took many days. The hearing of that news defined a generation, and for their entire lives many people remembered exactly where they were and what they were doing when they heard it, just as later generations would remember exactly where they were when they heard President Kennedy had been shot, or the Challenger had exploded. By the evening of the nineteenth—the same day—the news of Lexington had reached New Hampshire to the north and Rhode Island to the south. Within four days it had reached New York City, two hundred miles away. By April 26th the news of Lexington had arrived in Baltimore, Maryland, and Alexandria, Virginia. New Bern, North Carolina, heard the Lexington alarm by May 3rd, carried via ship from Newport, Rhode Island. Wilmington, North Carolina, heard by May 8th, and Charleston, South Carolina, by May 9th, also from the sea. The Shenandoah Valley on what was then the western frontier received the news overland about the same time. And when it reached a far western hunting camp on another part of the frontier, the hunters decided to name their camp “Lexington.” That camp today is the city of Lexington, Kentucky. A forty-year-old Massachusetts lawyer named John Adams, who had been arguing for some time for a political separation from Britain, heard the news on his farm in Braintree that afternoon, and immediately went to see for himself what had happened. He rode that evening along the battle road for many miles, and saw burned out houses, groups of people burying the dead, and refugee families trying to escape farther into the countryside. Adams remembered that day’s ride as a turning point in his life; it convinced him that “the Die was cast, the Rubicon crossed.” Within a year he would be working with Thomas Jefferson on the Declaration of Independence, and would go on to become the second President of the United States. So who is the Minuteman? 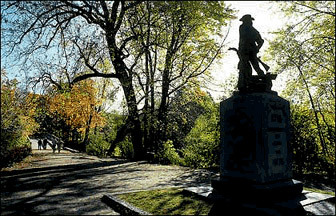 The Minuteman on the coin is an image of a bronze statue that stands today at the North Bridge in Concord. Emerson’s poem is inscribed on its base. That statue represents the 15,000 men, most of them farmers, who answered the alarm on this April morning, 225 years ago. In one hand he holds a musket, and in the other, the handle of his plow. The plow isn’t a myth: in many of the towns that received the Lexington alarm after sunrise, men were already out working in the fields and they literally left their plows in the furrows to answer the call. The statue was sculpted in 1875, for the hundredth anniversary of the battle. The town of Concord took a chance on that occasion, and hired a twenty-five-year-old local sculptor named Daniel Chester French. He didn’t have much of a reputation, and the Minuteman was his first public commission. But Concord chose well. French went on to become one of the greatest sculptors of his generation. Even if you have never seen the Minuteman you know French’s work: he sculpted the statue of Abraham Lincoln in the Lincoln Memorial. So whatever you are doing today, however busy you may feel, however short of sleep you may be, remember that 225 years ago today there were some people who were working a lot harder than we are. And a large part of the world we live in comes from them. And why do I personally remember the Nineteenth of April? One of the houses that George Washington used as his headquarters during the siege of Boston was called Wadsworth House, and I passed by its door every day for six years when I was in graduate school. He took command of the American army on the Cambridge Common, just a few blocks away. The village of Menotomy, where some of the fiercest fighting of the day took place, years later changed its name to Arlington, and that was the town where I was born. And among those farmers who worked so hard on this day those many years ago: old Private Ebenezer Burgess was my sixth-great-grandfather; Lieutenant Job Shattuck was my fifth-great-grandfather; young Simeon Dodge was my fourth-great-grandfather; and Lieutenant Zechariah Fitch, who had to leave behind his pregnant wife that morning, was my third-great-grandfather. While Zechariah was camped at Cambridge on the twenty-first, his wife gave birth to their fourth child. I am a descendant of their fifth child. So if anything had happened to Lieutenant Fitch that day, I wouldn’t be here to remember and to tell the story.